In 1776, soon after the beginning of the American Revolutionary War, the leaders of the war got together to write a letter to the King of England, George III. Sometimes one group of people decide to split off from another group, and to become an independent country, as the laws of Nature and of God say that they can. But when this happens, if they want other people to respect them, they should explain why they are splitting off. So whenever any government is getting in the way of these rights, people have the right to change it or get rid of it, and to make a new government, in whatever way seems most likely to make them safe and happy. People should not change their government without a good reason, so people usually suffer as long as they can under the government they have, rather than change it. But when there have been a lot of problems for a long time, it is their right and their duty to throw off that government, and to set up a better government. The King won’t let us pass laws we need for everybody’s good. Even when we do pass laws, he won’t sign them so they can go into effect. He calls men together to make laws in the most inconvenient times and places, so that they won’t be able to go discuss the new laws. The King won’t let new settlers come to America, and he won’t let the settlers take over new land from the Native Americans. The King won’t let us choose our own judges, and instead he chooses them all himself, so they’re all on his side. He sends lots of new government officials that we don’t want, and he makes us pay for them. The King sends lots of English soldiers here when there isn’t even a war, and makes us let them live in our own houses. He tells us these soldiers can do whatever they want and don’t have to obey the law. The King won’t let us buy and sell things from wherever we want. We can only buy things from England. The King makes us pay all kinds of taxes without asking us about it. He won’t let us have a jury for our trials, only a judge. The King tries to get the African-American slaves to revolt against us and tries to get the “Indian Savages” to attack us. When we ask him to stop, he just keeps on doing more bad things. We have tried to talk to the other people who live in England. We asked them to stop these crimes against us, but they have acted as though they were deaf. So we have to separate from England, and they will be our enemies during the war, though we hope they’ll be our friends when there is peace. So we think that God will see that we are doing the right thing when we declare that the United States are now completely independent of the King of England. We have no more political connection to England at all. And as independent states, we say that each state has the right to make war, to make peace, to make alliances with other countries, trade with other countries, and do everything else that countries do. And we promise that we will fight for our independence with the help of God – we promise by our lives, our property, and our sacred honor. Looking for a Halloween costume? Go as a Revolutionary War soldier! Among the men who signed this declaration of independence were Benjamin Franklin and Thomas Jefferson. This Declaration of Independence was an exciting letter to write – it laid out a lot of new ideas about the rights that all people should have. 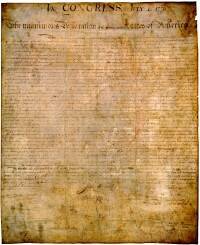 On the other hand, all of the people involved in writing the Declaration were rich white men. Even though they thought they themselves should have these rights, they were pretty vague about whether the same rights should apply to poor people, women, black people, or Native Americans – most of the people living in the United States at this time. Representatives of all these groups asked to be included, and some white men started out supporting their inclusion, but in the end, only rich white Christian men signed the Declaration of Independence. Really? Women and people of color complained? But even though the Declaration of Independence only applied to some people, it was a very important statement of the idea that everybody has rights. Did you find out what you wanted to know about the Declaration of Independence? Let us know in the comments! Learn by doing: which of these are good reasons? Why? Cite this page: Carr, K.E. Declaration of Independence (simplified) – United States. Quatr.us Study Guides, August 11, 2017. Web. April 20, 2019. Where the Declaration says “The king of England has done many bad things to us – here is a list:” after that, those are the complaints. For all you readers here, be cautious when reading one’s interpretation of a historical document when they use phrases such as “rich white men”, “poor, women, black people”, “Christians”. This verbiage usually indicative that the writer slants their history in a more ‘liberal’ stance versus historical true context. Phrases like this encourages class, religioius, and ethnic divisions Even in today’s politics, many of our legislatures are wealthy. If you look around the world, you will find that common thread. In reality, there was little slavery at the time of the Revolution. By the end of the American Revolution, slavery had proven unprofitable in the North and was actually dying out. The Indian population in the the area of the 13 colonies was also sparce. When the writer’s of the Declaration wrote “all men were created equal”, they meant it. It would just take time for blacks, women, etc to reach that status. Remember, many of signers of the Declaration of Independence and Constitution have origins and life experiences from England, where slavery was accepted, and then later outlawed, as should be. When researching history, be cautious of what you find on the internet and conduct your ‘due diligence’ in your research through many sources before drawing conclusions. Thanks so much for saying this, I agree! Go ahead and ask, Ethan, and I’ll try to answer it. I wish I could meet a few of are founding fathers and pick their archaic brains. What would you ask them, Jarred? I’ve marked off the beginning and end of the Declaration now with dotted lines, so maybe it won’t be so confusing. Thank you very much!! I am taking my first history class in college, and as a non-native Engliah speaker, the language and terms used in history books are very difficult for me to understand. This made everything so much simpler. Thank you!! Oh, that’s what I like to hear! That’s exactly my goal! So happy we could help. Sorry it’s confusing! This is an old piece of writing and it can be hard for us to understand 200 years later. Was there something you were trying to find out? If you ask a specific question, I’ll try to answer it. Hi Erik! Thanks for visiting.